Logan Letney turned in, perhaps his best performance all year on the mound, and Oak Ridge takes game 1 of the best of 3 series! Letney allowed 4 hits, 1 run, striking out 10 and walking 0. The lone Jesuit run came on what appeared to be a routine pop up to left field, but thanks to a stiff wind and a short porch, Jesuit scored on the solo home run. Erik Coomer got the scoring started for Ridge in the top of the second inning with a towering RBI double to deep center field. Oak Ridge would add 2 more runs in the top of the 5th. After a lead off ROE by Warren Sammons (pinch hitting for Cobb), Austin Brown would lay down a sac bunt to move the runner into scoring position for Chase Roberts. Roberts was hit by a pitch. Letney would then single home Cobb and move Roberts to 3rd base. James Starnes would then single as well, bringing home Roberts. That is all Letney would need as he was absolutely dominant on the mound. Game 2 is back at Oak Ridge, Friday, May 11th at 6pm! Come early for a little tailgate party! The Booster club is bringing the grill! Oak Ridge will move on to the second round of the play-offs for the 4th year in a row. The War Eagles took care of business in round 1, defeating Mesquite Horn 10-2, 12-2 (in 5 innings). Chase Roberts had a heck of a game throwing all 5 innings and going 4 for 4 at the plate with 3 doubles and the walk-off 2 run home run to end the game! Logan Letney, James Starnes, and Kevin Skweres also came through with huge at bats, raking in 6 RBI between them. In round 2, they will face Dallas Jesuit. The match up with Dallas Jesuit is an interesting one, as the Rangers have knocked the War Eagles out of the play-offs 2 of the last 3 years. Including a Regional final match-up in 2015 where the War Eagles were ranked #2 in the nation, and Jesuit #1. All of that is history now, and the current War Eagles are ready for their own battle with the Rangers! Oak Ridge took game 1 in the best of three vs mesquite on Thursday night. It took a couple of innings to get things going, but Ridge finally got on the board with 2 runs in the 3rd and then added 4 more in the 4th inning. Mesquite would answer with 1 run in the bottom of the 4th, but Oak Ridge scored 4 more runs over the next 3 innings to put the game out of reach. Logan Letney got the start for the War eagles and pitched 6 complete innings, allowing 6 hits and striking out 7. Blane Romero closed it out, striking out 2 of the 4 batters he faced, and allowing 1 hit. 11 different War Eagles had plate appearances, and 10 of those players had hits. In total, Ridge pounded out 14 hits and only struck out twice in 41 plate appearances. Chase Roberts, Carson Ogilvie, and Will Cardin all had multiple hits. The Oak Ridge War Eagles are District 12-6a CHAMPIONS!!! What a game! In a winner take all contest, Oak Ridge outlasted Montgomery 3-1, and came away with the win, and the District Title! 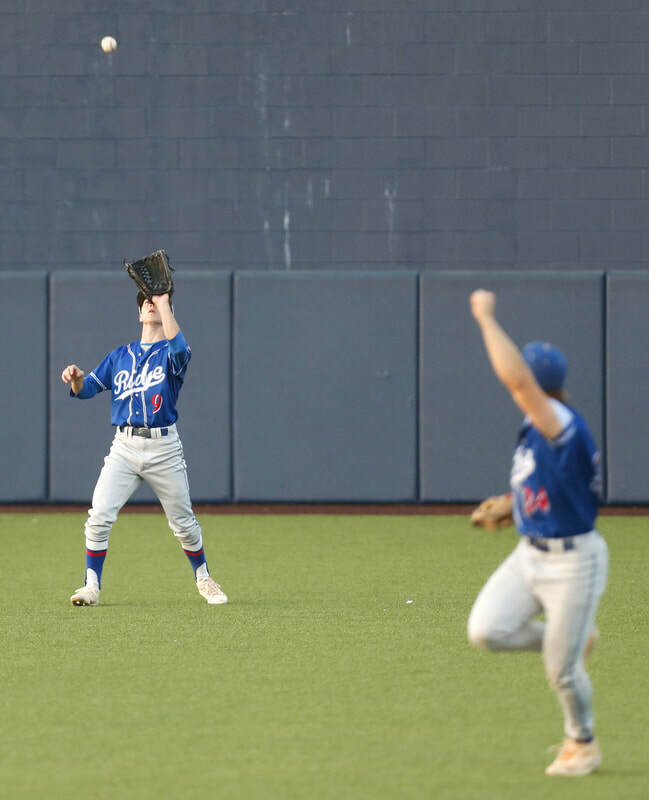 This is Oak Ridge's first District Title since 2015, when Luken Baker and Durbin Feltman lead a deep run into the State play-offs. This 2018 team hopes to do the same! Both teams had plenty of chances to score, but timely strike outs and great defensive plays kept the game low scoring. Oak Ridge looked they would score in the first inning, but with runners on 1st and 2nd with 1 out, James Starnes roped a ball straight to he 1st baseman, resulting a double play. Montgomery posed their own threat in the bottom of the 1st. With the bases loaded and 1 out, Chase Roberts got a K and then a fly ball out to Logan Letney to end the threat. Roberts would end up going 4.0 innings, allowing 3 hits and only 1 run, striking out 7. Ridge would get on the board in the 2nd with an RBI single by Blane Romero. After Will Cardin hit a 1 out single, Kevin Skweres was hit by a pitch, moving Cardin to 2nd base. Romero stroked a 3-1 fast ball to right field scoring Will Cardin. The top of the 3rd looked promising for Ridge as well. Austin Brown lead off the inning with a walk and then went 1st to 3rd on a Chase Roberts single. But with no outs, the War Eagles were unable to move Brown home. Oak Ridge would finally put a couple more runs on the board in the 4th. With 1 out, Kevin Skweres singled. DeBardinis (a recent sophomore call up) was put in to pinch run and did a great job stealing second and then moving to third on a Romero single. Then Cobb, with 2 outs would single home DeBardinis making it 2-0. Oak Ridge wasn't finished though! Austin Brown took a 2-2 inside fastball straight down the left field line for a double. Josh Cobb scored all the way from first making it 3-0 Oak Ridge! Both teams would threaten with runners in scoring position over the next 4 innings, but only 1 run for Montgomery resulted from all the base runners. Thanks in large part to Blane Romero. The Junior entered the game in the bottom of the 5th inning with no outs and runners on 1st and 2nd. Montgomery scored their lone run after a passed ball and a sac fly. Romero ended the night with 3 innings pitched, 0 Runs, 1 Hit, 1 Walk, and 5 K's. With the win, Oak Ridge secured the #1 seed for District 12-6a. Oak Ridge will face off against the #4 seed from District 11-6a. It took 3.5 hours and 10 innings, but Oak Ridge finally got the win against College Park. Logan Letney delivered a walk off double to right center field, driving in Chase Roberts in the bottom of the 10th inning. ​College Park got on the board early, scoring 2 in the top of the 1st. A lead off walk, followed by an error an a passed ball would give CP the early lead with no hits. Oak Ridge responded in the bottom half of the inning with 2 runs of their own. Chase Roberts hit a double, followed by 2 straight walks to load the bases. Carson Ogilvie would deliver the RBI single to bring in 1 run. Owen Dubois followed that up with a bases loaded walk to knot the game at 2. Oak Ridge threatened to break the game open during the first three innings, but could not get the big hit they needed. Each inning ended with the bases loaded. The only other damage occurred in the second inning when Austin Brown drew a 1 out walk and later scored on a James Starnes ground out. CP would quickly answer by scoring a run of their own in the top of the 4th. Oak Ridge would take the lead back in the bottom of the 6th. Logan Letney reached on an error and was brought home by Carson Ogilvie. College Park fought back again in the top of 7 with a lead off single. The next batter popped up his sac bunt to James Starnes for the first out. With a runner on first, Ridge would allow to more runners to reach with a hit by pitch and a walk, loading the bases. A sac fly to deep right center would bring home the lead runner and tie the game at 4 each. The game would stay tied until the bottom of the 10th. There were several incredible defensive plays by both teams to save hits/runs. With 2 outs in the 10th inning, Chase Roberts lined a single up the middle. After Roberts stole second base, Logan Letney delivered on a 2-1 count with the walk off double off the right center field wall. The win keeps Oak Ridge 2 games ahead of The Woodlands (who also won last night) in the district standings. Montgomery lost to Lufkin, setting them back 3 games from the lead. ​5 Games remain in district. Oak Ridge can secure a district title with 3 more wins, (or a combination of Oak Ridge wins and Woodlands/Montgomery losses totaling 3). The last district title for Oak Ridge came during the undefeated district season of 2015, lead by Luken Baker and Durbin Feltman. Oak Ridge secures post season play with 1 more win. Next game is at College Park on Friday night, 7pm! Oak Ridge managed to fight back on Friday night at home, after dropping a game at The Woodlands earlier in the week. In front of a great home field crowd, on a night set aside to honor our sponsors, Oak Ridge beat the Highlanders 7-3. The Woodlands got on the board early in the top of the 1st with a 2 out double off the wall. The War eagles would not answer until the bottom of the 3rd inning. After a Josh Cobb single and a fielder's choice by Brown, The Woodlands would walk 3 batters in a row, bringing in Brown to tie the game. Owen Dubois added to the inning with a 2 out, 2 RBI single to make the score 3-1. Ridge would add one more in the inning on a wild pitch. Oak Ridge starting pitcher Chase Roberts kept The Woodlands in check throwing 5.2 innings, striking out 10. Oak Ridge would add one more run in the 5th and 2 in the 6th to bring the total to 7. In the 5th inning, Carson Ogilvie hit a 1 out single to left field. When the ball skipped away from the left fielder, Ogilvie took advantage of the error and hustled all the way to third base. He was later brought in by a Dubois sac fly. Ridge would tally the final two runs in the 6th with a Logan Letney double plating Brown, and a James Starnes single, plating Letney. Blane Romero was solid in relief striking out 4 of the 5 batters he faced. With the win, Oak Ridge holds a 2 game lead in the district standings. Montgomery split their series with College Park, which ties them with The Woodlands, 2 games out of 1st place. Anything can happen as everyone still has 6 games remaining in district play. The top 4 teams will make the play-offs. The War Eagles have a non-district match up vs power-house Tomball tomorrow, and then return to district play with a home and away series next week vs College Park. The War Eagles faced a tough and determined Conroe baseball team on Thursday night but came away with a dramatic win. The win secures a series victory for Oak Ridge over Conroe (2-1) and puts Oak Ridge at the top of the District standings at 6-1, 2 games in front of The Woodlands and Montgomery. Chase Roberts got the start on the mound and was nearly un-hittable. In 6.2 innings, Roberts struck out 18, allowed 1 hit, and 0 earned runs. The only blemish was 5 walks which Conroe would capitalize on in the top of third inning. After walking two, the Conroe runner at 2nd base would steal third and then reach home on a errant throw by the Oak Ridge catcher. After the run scored, Roberts would again take command and retire the next 12 batters he faced, in order. 10 of those 12 were retired with a K! Oak Ridge would answer in the bottom of the 4th. Erik Coomer hit a towering double off the top of the wall in right center field. Kevin Skweres would execute a perfect sac bunt to move pinch runner DeBaradinis to third base. Pinch hitter Owen DuBois would be called in to hit, and delivered an RBI single to right field, tying the game, 1-1. The score would stay tied until the bottom of 7. Josh Cobb and Logan Letney both walked to put runners at 1st and 2nd with no outs. Conroe would bring a new pitcher in for Chase Roberts. Roberts saw 1 pitch and took it over the right field fence for a game winning, walk off, 3 run home run! With the win, Oak Ridge sits atop the District standings, 2 games in front of Montgomery and The Woodlands (both at 4-3). Oak Ridge will play a home and away series vs The Woodlands next week.